Apparently, the gamble Sony Pictures Entertainment (SPE) took by releasing The Interview online has paid off, as the company has revealed that the film, which was made at a budget of $44 million, grossed over $15 million in online sales through the first four days of the holiday weekend. Put another way this is now the studio's "number 1 online film of all time." This is in addition to the estimated $2.8 million the movie earned from its limited theatrical release -- it was released in just 331 theaters across the US. "Through Saturday, December 27, including all of its online distribution platforms, The Interview has been rented or purchased online more than 2 million times," Sony Pictures said in a statement. The movie was released online on Christmas eve via YouTube, Google Play, Xbox Video, and a dedicated website -- https://www.seetheinterview.com/. Yesterday, Apple also made the film available on its iTunes store at the same prices -- $5.99 to rent for 48 hours and $14.99 to purchase. 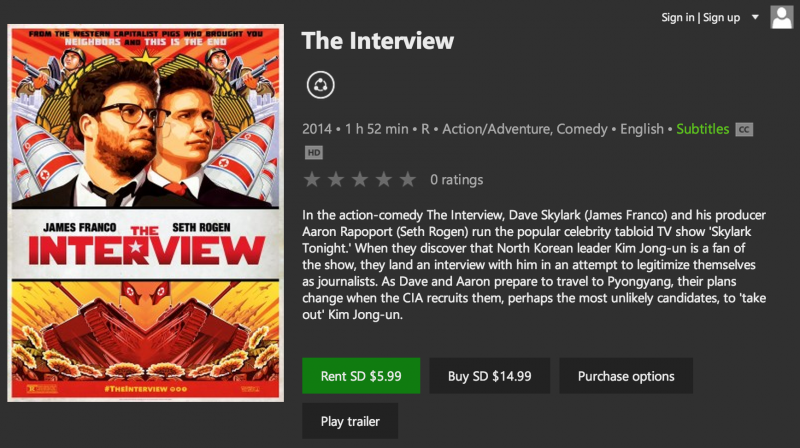 The Interview has been at the center of a well publicized controversy apparently because it depicts the assassination of North Korean leader Kim Jong Un. Earlier, Sony canceled the release of the Rogen / Franco comedy after the country’s top five theater chains decided not to play the film due to the hackers' threat of attacking movie theaters showing it. After being widely criticized for what many saw as bowing down to the hackers as well as North Korea, Sony backpedaled on its decision, announcing that the movie will make it to theaters on Christmas Day after all.